The death toll from an earthquake in Tibetan area last week reached 1,944 today according to official statistics. Zhang Heng (78-139) was quite the Han dynasty renaissanceman. Despite his fame as a poet of considerable talents, a celebrated scholar of the classics, and an official serving at court, Zhang’s greatest and best-known contributions actually came in the field of science and engineering. 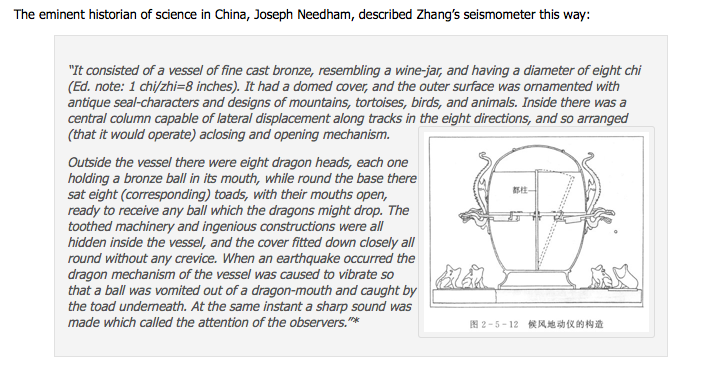 […] Zhang Heng is perhaps most famous for inventing the world’s first seismometer, the 候风地动仪 houfeng didongyi. "The Lost Curse" poses a series of questions about official reactionsto the earthquake and the relief efforts, along the way mocking the Chinese bureaucracy, drawing parallels with the 2008 Sichuan earthquake,quoting Mao, referring to the belief that animal reactions supposedly should forewarn impending earthquakes and sharply critiquing the Han-Chinesefad for Tibetan mastiffs that the affected earthquake area Jyekundo in Kham is famous for.High Peaks Pure Earth has been monitoring online reactions to the earthquake by Tibetan netizens, this is our third post. The first post can be read here:http://www.highpeakspureearth.com/2010/04/earthquake-in-tibet-initial-reactions.htmland the second post can be read here:http://www.highpeakspureearth.com/2010/04/earthquake-in-tibet-tibetan-netizens.htmlTentative Questions for the Earthquake Press Conferenceby"The Lost Curse"
There is something to make one angry and disappointed and confused – How was the Qinghai Seismological Bureau not able to anticipate the earthquake? Especially, how is it that no one has come out to talk about the events? Is there no Seismological Bureau in Qinghai? If there is such a Bureau what is the Qinghai Seismological Bureau doing? It is such a big department that has a lot of expenditures- are the people who work there useless? If they are of no use, then itis time to close the office or to change the staff. (I suggest: replacing the office with more sensible staff who have no political motivations, the team should be composed of snakes, rats, frogs and 2 crows, the snake would be the Party Secretary, the frog would be the Bureau Director, the rats would be the engineers, one crow would be working as the office manager and one crow would be the press officer, this team would take over the Seismological Bureau, as soon as they start working, although they are not Party Members, I can guarantee withmy own integrity that these five comrades will be more capable of predicting earthquakes than the current staff). Additionally, certain netizens, no matter how many 50 cents you get, don't tell me that earthquakes can't be predicted, be careful that the Dong Han dynasty's Zhang Heng might come out and slap you saying that you are humiliating your ancestors. If you look at Tibetan astrology, then two or three people in a small office have been able to predict many earthquakes. 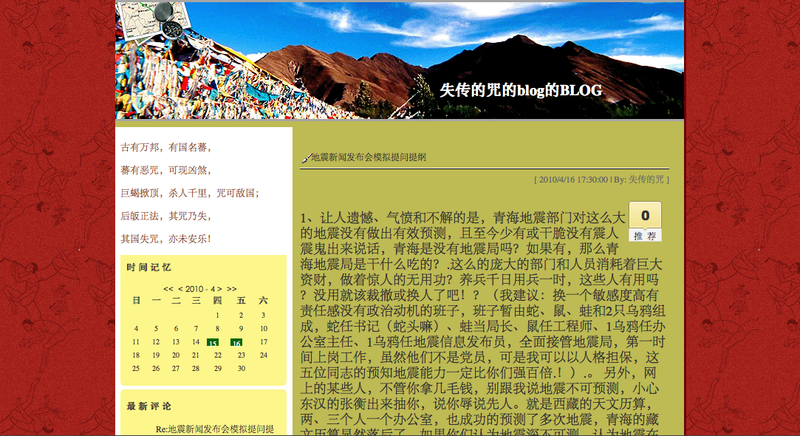 It is clear that the Qinghai Tibetans’ way of predicting earthquakes is backward. If you accept that it is not possible to predict earthquakes or if you consider earthquakes to fall under the rubric of metaphysics, then why establish this office and fill it with staff and spend so much money on this department? Was it to have ordinary people give their lives, homes and wealth to you? Was is so that people would be born peacefully and then not even know how they died? Was it to maintain stability before the earthquake and then to deny the "rumours", or was it to be seen as promoting knowledge about earthquakes afterwards and tocount the frequency of earthquakes in the world? If it is because of lack of intelligence or resources that you failed to predict the earthquake, then at 5.39 am when the 4.7 earthquake happened what were you doing? Logically speaking, when the earthquake happened, the National Monitoring Centre should have known atthat time- and the prefecture and county Seismological Bureaus should also have known. At the very least there should be someone on duty 24 hours. (Even hiring an illiterate person who could just sit and watch and shriek in the monitoring office at 5.39 am would be enough) Heaven sent a clear signal; why wasn’t a warning sent early, why wasn’t a notice released? Was it to preserve harmony or to maintain stability? Was this why a warning was suppressed? Was it to show that Chinese and Tibetans are one family and that the people and the army are inseparablelike fish and water? Was it for the Shanghai World Expo? Or are there other unknown reasons? Out of generosity, I am making these conjectures:if it wasn't that they knew but didn't warn, had doubts but didn't warn, it can only be that they weren't able to issue a warning because they are retarded or they are careless and failed in their duty, right, my bureau leaders? Please answer, how come no one is replying? Is it because they all died in the earthquake? In the past there were several earthquakes in the 1990s and there was an earthquake two years ago. Why was it not possible to take bitter lessons from those disasters and establish an early warning mechanism inthe Yushu prefecture? Is there a satellite warning system? At 5.39am when the first earthquake struck, were all the Jiegu leaders asleep? After the earthquake struck, what happened that there was such a lack ofmedicine and relief materials and it turned into an emergency? Weren't there any emergency relief supplies? Even in the Mao era, it was said that preparation of war and preparation for natural disaster was for thepeople!!! After many school dormitories collapsed during the Sichuan earthquake, how come the Yushu prefecture didn’t take any notice? Don’t you know that Yushu is on the seismic belt? The school dormitories were not renovated-isn’t it possible to reconstruct? Apart from natural disasters, where is the responsibility of the related persons? What lessons can we learn from this experience? How is it that in the Prefecture headquarters area all the people’s houses are of such poor quality that they have broken like eggs? If these houses that could not withstand earthquakes are built privately, then shouldn’t the governmentissue some advice or policy regarding this? Likewise, in Yushu, why is it that in the aftermath of the earthquake, there is such a big difference to be seen between the people’s houses and government offices? Why is it that during a 7.1 Richter scale earthquake, the firstwas shown to be so poor and the second was so strong? I saw an electricity pole that had fallen at a 45 degree angle and behind that I saw people’s houses that had totally collapsed. This was almost satirical. If people say that these people’s houses had been built a long time ago, then how do you explain the new houses that farmers and nomads have moved into which are now in ruins? This is something to turnyour stomach. Right after the earthquake, the distance was very far and transportation was blocked- so to arrive there on the spot was very difficult. The current conditions are better than the conditions in Wenchuan- why is it not possible to airdrop food and rescue workers fromplanes? Were there no animals in Jyeku at that time? Didn’t they have any abnormal reactions (to predict the quake)? Have our people sold off all their Tibetan mastiffs? …………There are many questions. But for today I will stop here. I will continue to monitor the relief effort. At the same time, I thank the nation’s people for their support. I thank the brothers and sisters who are participating in the relief effort without regard for altitude sickness.